Our feeders continue to be very busy with swarms of Redpolls in our backyard that outnumber all other birds even the House Sparrows. Although nothing as exciting as a Boreal Owl has come to our yard recently, we were pleasantly surprised by a Pine Siskin at our nyjer (thistle seed) feeder. In our area Pine Siskins are migratory but are year round residents in the southern part of our province so, seeing one at our feeders in the winter is uncommon but not rare. How long this particular bird has been in our yard is anybody's guess as Siskins are quite similar to Redpolls and are easily overlooked. The middle of February brings with it our very first summer resident, the Horned Lark, a member of the lark family that includes the pipits and the famed European Skylark among others. This early arrival of the Horned Larks precedes the arrival of the rest of the summer birds like crows and bluebirds by a month or so. To me there is something reassuring about Horned Larks twittering on a warm and sunny February day as they fly overhead. Furthermore, seeing pairs of Horned Larks feeding on the shoulders of our roads while there still is lots of snow in the fields tells me that spring must be on the way. By the end of March, regardless of the snow on the ground, nesting is well on the way. In my mind the arrival of the Horned Lark beats the groundhog thing on February 2 hands down. 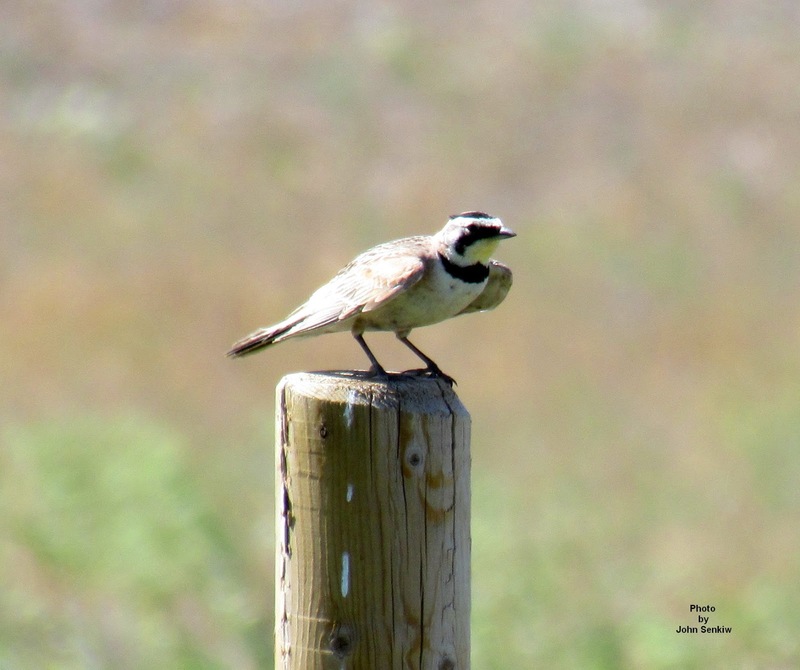 Horned Larks are circumpolar in distribution with birds from different areas having slightly different field marks resulting in at least seven different recognizable subspecies in North America alone. In Canada all are birds of wide open spaces nesting on either side of the Boreal Forest on the plains and Tundra and migrating a little bit to the south in the winter. On the rest of the continent they live year round in all of the United States and most of Mexico where there is suitable habitat. Locally, they are found in undisturbed grassy areas like pastures and roadside ditches but are absent in cultivated fields. 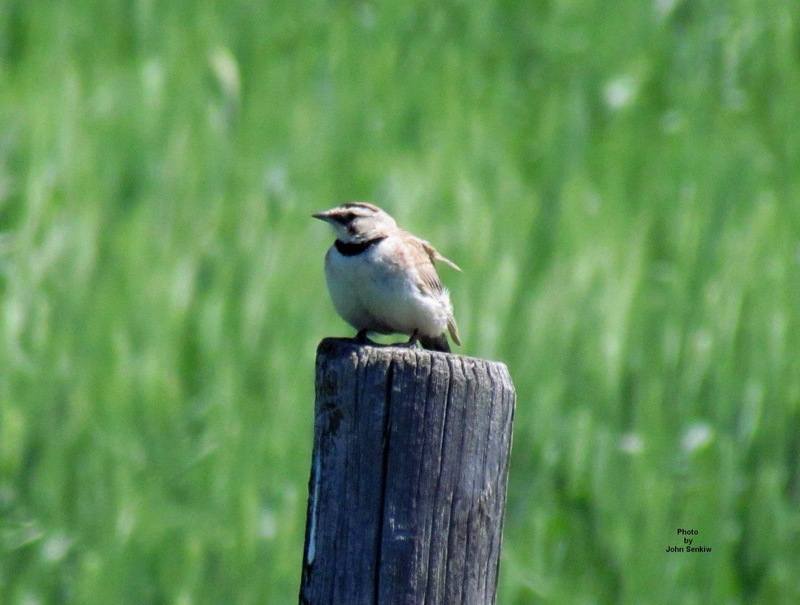 With the decrease in mixed farming and subsequent increase in crop farming the Horned Lark population has declined in the parkland area, however, in the southern grasslands the populations are healthy. The Horned Lark gets its name from the small feathery tufts on either side of its head that vaguely resemble little horns although many of the subspecies do not have any "horns" at all. All the birds do have broad black "sideburns" or masks that extend from the eye downward to the lower chin and a prominent black breast band much like that of a Killdeer. Some of the subspecies, including the local ones, have yellow throats. It has a weak but pleasant tinkling song that it often produces while circling in a slow fluttering flight (larking) although it also sings from a perch such as a fencepost. Once heard the song is easily remembered and recognized. Males and females are more or less the same with the females being a bit more drab and not sporting any "horns". This week's pictures, one of a male and another of a female, were taken two years ago near Coronach, Saskatchewan. Except for the "horns" on the male which are barely visible the field marks are very clear. (Obviously, the yellow throat markings will not be visible in black and white.) Now, which is the female and which is the male?